Despite finishing a healthy sized BBQ lunch at the Cozy Corner, Sam and I had further lunch plans. It might seem a bit outlandish, but we didn’t drive three hours for one meal; no, if we were putting this much effort into lunch, there would have to be more than one stop, but where? Even though I had been heavily encouraged by the NMC to pay a visit to Payne’s for a chopped pork sandwich, I convinced Sam that a BBQ on BBQ lunch would be too much smoky goodness for us to handle in one sitting. Since we were near downtown, we decided to indulge in another southern staple, fried chicken. 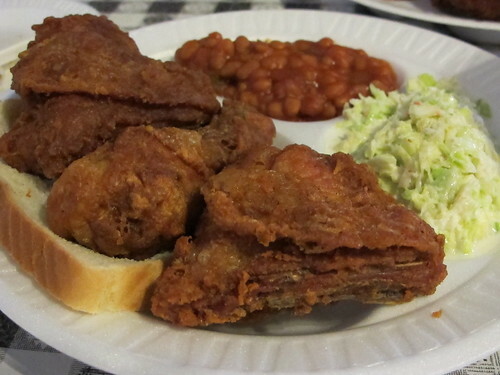 Memphis may be overrun with restaurants that offer steaming hot plates of fried yard bird, but I had one place in mind, Gus’s World Famous Fried Chicken, a restaurant I first became aware of when I borrowed my sister’s copy of Southern Belly by the indispensable John T. Edge. 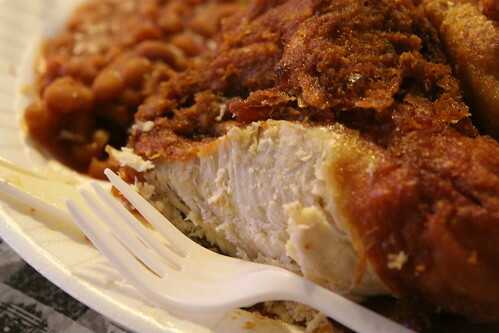 In Southern Belly, edge writes about the origins of Gus's at the original location in Mason, TN and the more than 50 year struggle of patrons trying in vain to uncover the secrets of the batter. While I would love to visit the birthplace of Gus’s, I was happy to make do with the 10-year-old downtown outpost. If you aren’t familiar with the works of Mr. 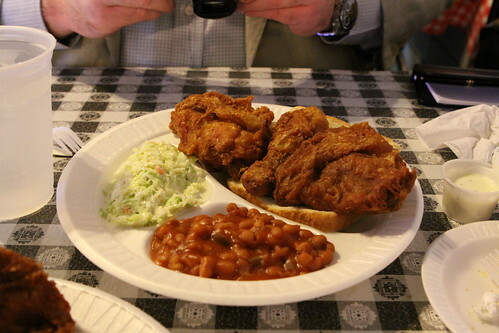 Edge, you may have seen Gus’s Fried Chicken mentioned on the Travel Channel show Man Vs Food. In only the second episode of the series, Adam Richman visits Memphis to duel with the Sasquatch burger, but along the way he stops by Charlie Vergos’ Rendezvous and Gus’s Fried Chicken. Although the video may be full of contorted faces and semi pornographic moans, it provides a interesting look behind the scenes at Gus’s. With the words of Richman and Edge still fresh in my mind, Sam and I found parking on a side street and made our way to Gus’s. Gus’s may be situated in an unassuming brick building, but it was hard to miss the glowing mustard yellow of the door and sign. I wonder why the words “world famous” are in green? Even at one in the afternoon, every table at Gus’s was packed and the line was nearly out the door. A casual conversation with another hungry visitor revealed that Gus’s is like this all the time, “It’s 50 in, 50 out.” Doing my best to remember that patience is a virtue, it was, thankfully, a quick 15 minutes before our name was called. Picking a table close to the kitchen, we were able to see the whole process. Opposite that was the bank of fryers. 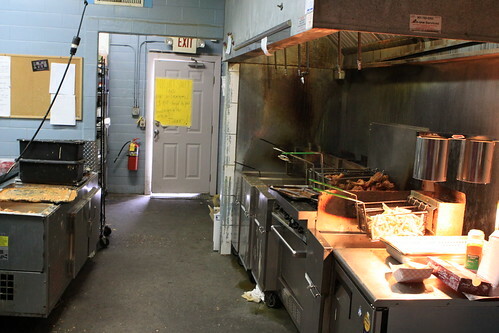 They may not be the cast iron skillets that Edge describes at the Mason location, but the fryer baskets of grease dripping chicken are just as tantalizing. Although there were other items on the menu, Sam and I came to Gus’s for one reason, chicken. 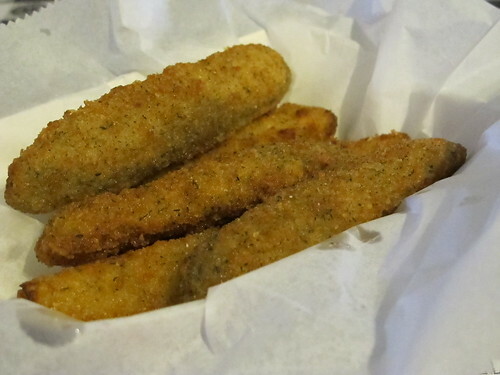 Of course, Sam didn’t blink an eye when I ordered an appetizer of fried pickles. 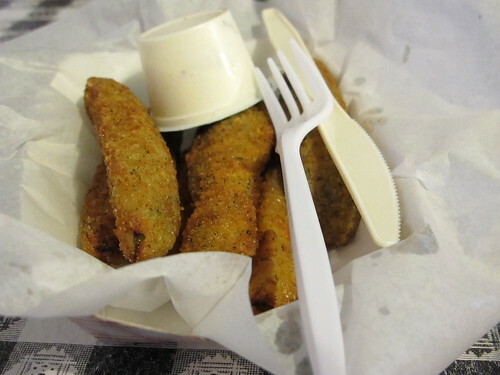 Everything I’ve read about Gus’s mentions the long wait times, and there are few better ways to pass the time than by indulging in a basket of fried pickles. When there’s fried food, ranch dressing is never far behind. Skipping the wedge cut slices, this was a basket of pickle spears that were coated in thick, mozzarella stick batter that peeled off at the lightest touch. 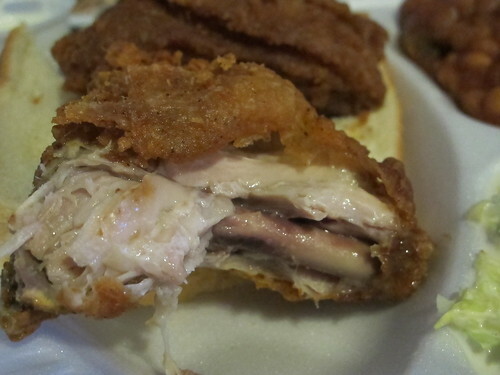 While the fried pickles may have been forgettable, we were soon graced with the appearance of our fried chicken. Knowing if I didn’t try the sides first, I would never touch them, I went for the baked beans and found a decent but one dimensional flavor that was oddly reminiscent of ketchup. Infinitely more important was the chicken and what a color. Tinted a deep golden caramel, this chicken was covered with a thick skin that accentuated each bite a hearty crunch. A little salty and with a lingering cayenne heat that left me wanting more, this chicken was worth the wait. Did I mention this dark meat was juicy and rich with chicken flavor? 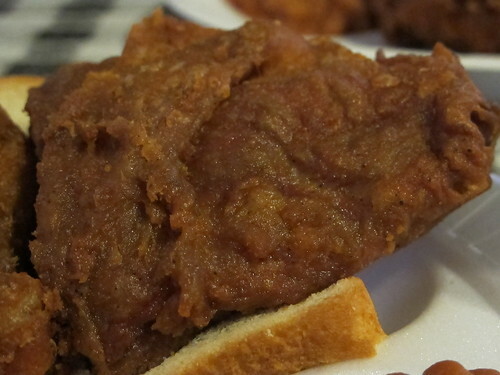 It’s a flavor that is often missing from fried chicken, but it was here in spades. Sam, having ordered white meat and being the generous soul that he is, was open for a chicken trade. We swapped a thigh for a breast and I immediately realized that I got the short end of this stick. Everything that was wonderful about the crust was still here, but it only accentuated the dryness of the white meat. Looking out at the tables at Gus’s, I saw plate after plate of white meat; this made me wonder just what was going through these people’s minds. As much as everyone was gushing over the flavor of the chicken, If only they knew just how superior the dark meat was to the white meat, if only they knew what they were missing, their taste buds might be pushed over the edge. 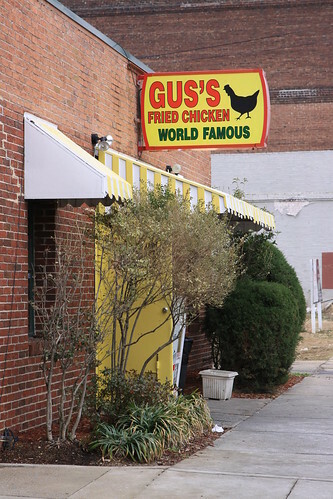 All hyperbole aside, Gus’s World Famous Fried Chicken is an excellent choice for fried bird and well worth a visit, but, to me, the spiciness of the chicken was a tease. 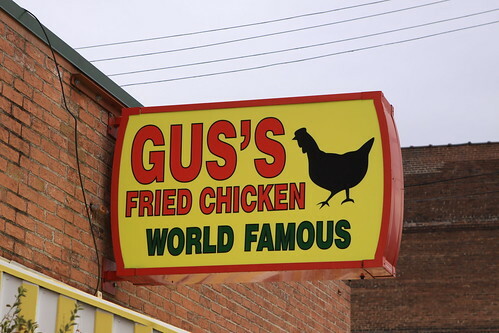 With each bite of Gus’s chicken, I was waiting in vain for that punch in the mouth that I got from Prince’s or Bolton’s in Nashville. That being said, it's unfair to compare those restaurants to Gus's; they each practice a completely different approach to fried chicken perfection and succeed in their own way. 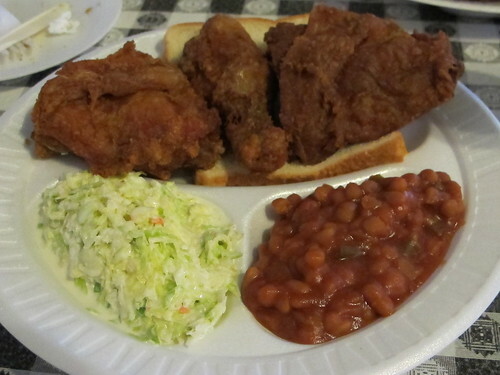 Not to mention, if I'm that dead set on hot fried chicken, Nashville is only a three hour drive from Memphis.